This type of tempered will not pose a safety hazard if broken. Current building codes require safety glazing in all doors, walking surfaces, bathroom tub & shower enclosures, patio furniture, sidelites, and other applications in high traffic areas where there is a potential for injury. Tempered Glass increases the strength approximately 4 times; however, the process makes the glass brittle and can warp its surface. The process involves heating the glass to approximately 1400 degrees, then chilling (quenching) it to 200 degrees within 2 minutes. Once tempered, it cannot be re-cut without shattering. For this reason, all fabrication must be done before the it is tempered. 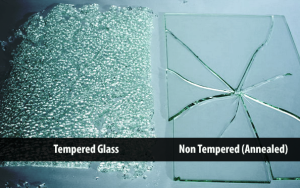 Tempered is used in applications where standard glass could pose a potential danger, because it is four to five times stronger than standard annealed and does not shatter into large shards when broken. Manufactured through a process of extreme heating and rapid cooling, tempering is significantly harder than normal glass. The thermal process that cures tempered also makes it heat-resistant. Tempered glass can be used in any situation where there is a danger of the glass breaking due to impact or extreme heat. Laminated impact glass windows is typically 2 pieces with a plastic inner layer. The most common application for this glass is the windshield of a car. If the windshield is broken, the laminated impact glass windows will keep the passenger inside the vehicle. Another common application is in jewelry stores to defend against robbery. The inner layer is .030-.090 thick, providing an excellent ultraviolet screen which can reduce fading in upholstered items and carpets. This type also has sound reduction qualities. The primary limitation of laminated , however, is strength. 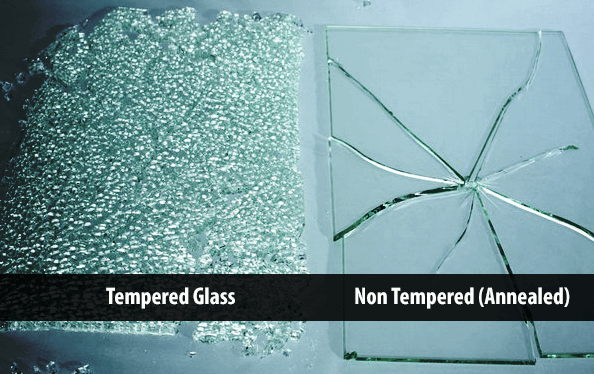 It can break with just 1/8th of the pressure required to break tempered glass. We have the capability of supplying and installing Tempered and Laminted Impact Glass Windows in many thicknesses and sizes. Call us today at (850) 837-8329 to set up a free appointment!